This fun "Babies Blocks" maternity t-shirt is a whimsical way to announce that you're expecting more than one bundle of joy. "Babies on Board" is a fun way to announce that there is more than just a baby on board! Professionally screen printed on maternity tailored, 100% cotton t-shirt from TummyWear. We had the idea for our "Got Babies" maternity shirt design shortly after our first ultrasound when we found out that yes, we were pregnant, and surprise - we were pregnant with twins. You moms expecting triplets have our utmost respect and admiration. 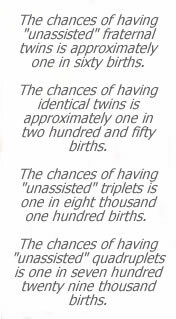 We've created Got Triplets! especially for you.